Healthy diets and conscious lifestyle changes are more common today than ever before, but sometimes the craving for something unhealthy is too strong to ignore. Whether it’s a juicy cheeseburger, a ketchup slathered hot dog, or pizza, everyone needs something deliciously deviant at one point or another. If you live in the Stamford apartments and chicken wings are your Achilles heel, then these ten locations are ready to satisfy your cravings. Murphey’s is easily one of the most popular neighborhood bars in Stamford. They offer a full menu during the day containing everything from chili to flatbread toppers and sandwiches, but you’ll want to come for their succulent chicken wings. Wings come in two varieties here, regular friend and jumbo grilled. The fried version comes tossed in your choice of Thai, garlic parmesan, or BBQ. Meanwhile, the jumbo grilled are pre-baked with Murphy’s secret spice rub and finished with a char-grill before being served plain or buffalo style. Either way, they’re worth the short trip to this establishment. Best of all, you can find drink specials a-plenty to pair with your meal. There are a number of taps with rotating seasonal beers included. The overall vibe of the bar, including their beer selection, is Irish. However, you can find an excellent variety. Soul Tasty specializes in comfort food like smothered pork chops, BBQ chicken, and baked macaroni and cheese. Naturally, they also serve delectable chicken wings. You can pick them up as part of their Tasty Box, which is served with fries or dirty rice (you can substitute anything for one dollar). This southern-style eatery serves outstanding lemonade and fresh brewed sweet tea to wash your wings down and has a varied enough menu to satisfy nearly anyone’s tastes. From sandwiches to piled high ten-dollar meals, you really can’t go wrong with Soul Tasty. Brennan’s is an excellent place for an after-work drink, as are plenty of stops in the Stamford area. Its beachside locale is relaxing, and there’s plenty of brews and spirits to choose from. Their menu, however, is what keeps patrons coming back for more. Staring down New York Strip steak, seared lemon salmon, and five juicy burgers is enough to make this location anyone’s dinner or lunch stop. Head over to the appetizer section of the menu and you’ll find twelve breaded wings for under ten dollars. They serve theirs plain or tossed in buffalo sauce, with your choice of dip. It’s a filling appetizer that pairs well with others on the list like avocado fries and steamed littleneck clams. Regardless of your choice, the wings are delicious. With a name like Chicken Joes and a mean logo to match, you can rest assured that this eatery knows their wings. They offer plenty of appetizer favorites from jalapeno poppers to fried calamari alongside gourmet pizzas, sandwiches, and fried fish. It’s an all-in-one stop for all of your cravings, but the “bangin’ bites” section of the menu is where you’ll want to look. Their wings fall into three categories. First, you can order the “bangin’ bites” in honey BBQ, orange glazed, or buffalo and ranch. Second, their hot wings come with blue cheese and celery ranging from eight to twenty-four counts. Finally, JoJo’s “glazed and blazed” wings come slathered in the same choice of sauces from the “bangin’ bites” section, but these wings are boneless. Regardless of your choice, everything is delicious. Don’t be afraid to try something new here, Chicken Joes knows exactly what you’re after and aims to please. Bedford Hall is a craft kitchen and bar with an upscale feel set in an industrial design. They offer everything from bar classics to upscale dinner choices ranging from miso glazed salmon to mushroom and spinach ravioli. The open-faced blue crab melt is a must try, among several other dishes, but not before giving their wings a go. Bedford offers what they call ten spice wings. The rub is combination of ten spices created by the hall, which comes together to create a sweet yet spicy taste that’s out of this world. All of their wings are served with blue cheese sauce made in-house and crisp vegetables. There’s a reason this dish is at the top of the starters section of the menu. Yes, they’re that good. A local favorite, The Brickhouse is a family owned and operated bar with an extensive list of drinks and homemade comfort food. They offer plenty of entertainment from live music to karaoke, and plenty of games throughout the rooms of the bar like darts. At any given point in time, you can find twelve craft beers on tap and a near limitless selection of wines and spirits. All of which pair perfectly with dishes like Mini Miyagi’s (a delicious Asian cuisine combination) and the bacon cheeseburger quesadillas. When it comes to wings, Brickhouse’s have been rated the best in Stamford. Dinosaur is the place to go for smoked and sauce-slathered meats. They cater to all sorts of dietary restrictions and allergies, have live music and events throughout the week, and offer an incredible Texas/Southern-style menu of succulent meats. You’ll find their jumbo chicken wings right in the appetizer section. These bad boys are spice rubbed, pit smoked, then grill finished. There are a number of hot and mild sauces, as well as their Devil’s Duel sauce if you’re feeling adventurous. Despite their carnivorous menu, they do offer veggie options as well. Vinny’s is a unique mix of bar classics, restaurant favorites, and oddities that never fail to satisfy. Their menu is enormous, but their Vinny’s Famous Wings sections isn’t hard to find. These perfectly fried chicken wings come in an eight or fifteen count and your choice of a wide variety of sauces. 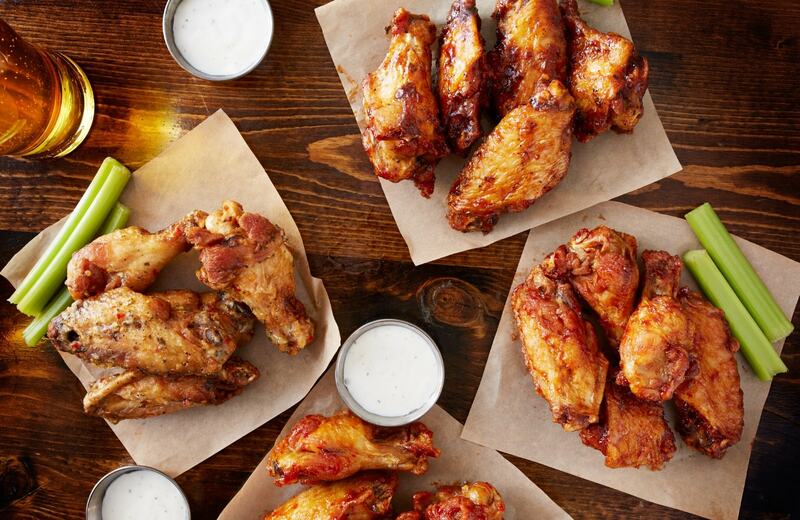 Each wing selection comes with your choice of side, too. Give the sweet potato fries with cinnamon-honey drizzle a try. Bobby V’s is exactly what you would expect from a high-end sports bar, but they also have indoor golf. There are a seemingly endless number of drinks to wash down any of their tasty menu items with, and they know how to cater to sports fans. When it comes to wings, their deep-fried delights have a separate section on the menu. You can order fifteen or twenty of them with your choice of sauce or dry rub. All of the favorites are there along with unique selections like West Indian Jerk and Spicy Coconut Curry Glaze. Love them or hate them, the people of Stamford have helped their local Buffalo Wild Wings reach the top ten list for best wings. It’s understandable, the chain offers dozens of unique flavor combinations that range from sweet to insanely spicy. You can order them in bulk while you sit and enjoy the game, and their drink selection is decently vast for a chain restaurant. All of these wing hotspots and more are moments away from the Waypointe. Located in Connecticut’s premier waterfront destination, these apartments redefine luxury by offering an unmatched living experience in Norwalk. With a curated selection of luxurious amenities ranging from a state-of-the-art fitness center to a saltwater pool and landscaped dog park, everything you need is right outside your door. Experience the finest in modern comforts and envious appeal. Welcome to the Waypointe, and unparalleled living experience.